There are limited data regarding breast cancer subtypes among Hispanic women. The current study assessed the distribution and prognosis of molecular subtypes defined by joint expression of the hormone receptors (HR; estrogen and progesterone) and human epidermal growth factor receptor 2 (HER2). Using California Cancer Registry data, we identified Hispanic women diagnosed with invasive breast cancer from 2005 to 2010. Breast cancer subtypes were defined as HR+/HER2−, HR+/HER2+, HR−/HER2+, and HR−/HER2− (triple negative). 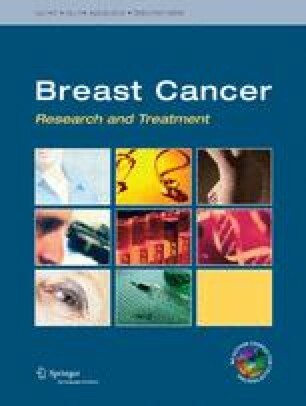 We estimated breast cancer subtype frequencies and used polytomous logistic regression, Kaplan–Meier survival plots and Cox regression to examine differences in relation to demographic and clinical characteristics. Among 16,380 Hispanic women with breast cancer, HR+/HER− subtype was the most common (63 %), followed by triple negative (16 %), HR+/HER2+ (14 %), and HR−/HER2+ (8 %). Women in lower SES neighborhoods had greater risk of triple negative and HR−/HER2+ subtypes relative to HR+/HER2− (p < 0.05). Hispanic women with triple negative and HR−/HER2+ tumors experienced poorer survival than those with HR+/HER− tumors. Breast cancer-specific mortality increased with decreasing SES, relative to the highest SES quintile, from HR = 1.38 for quintile 4 to HR = 1.76 for quintile 1 (lowest SES level). Our findings indicate that Hispanic women residing in low SES neighborhoods had significantly increased risk of developing and dying from HR− than HR+ breast cancers. Similar patterns of subtype frequency and prognosis among California Hispanic women and studies of other racial/ethnic groups underscore the need to better understand the impact of SES on risk factor exposures that increase the risk of breast cancer subtypes with poor prognosis. MPB, SA, and WFA are employees of the National Cancer Institute at the National Institutes of Health and no additional funding was provided specifically for this work. The collection of cancer incidence data used in this study was supported by the California Department of Health Services as part of the statewide cancer reporting program mandated by California Health and Safety Code Section 103885; the National Cancer Institute’s Surveillance, Epidemiology, and End Results Program under contract HHSN261201000140C awarded to the Cancer Prevention Institute of California, contract HHSN261201000035C awarded to the University of Southern California, and contract HHSN261201000034C awarded to the Public Health Institute; and the Centers for Disease Control and Prevention’s National Program of Cancer Registries, under agreement #1U58 DP000807-01 awarded to the Public Health Institute. The ideas and opinions expressed herein are those of the authors, and endorsement by the State of California, the California Department of Health Services, the National Cancer Institute, or the Centers for Disease Control and Prevention or their contractors and subcontractors is not intended nor should be inferred.